What Makes a Good Egg? In approximately 15 percent of cases where couples are unable to conceive, the underlying cause of infertility is not known. Researchers at University of California San Diego School of Medicine and in the Division of Biological Sciences at UC San Diego have identified a protein in mice that must be present in eggs for them to complete normal development. Without the protein, called ZFP36L2 or L2 for short, the eggs appear ordinary, but they cannot be fertilized by sperm. Female mice lacking L2 in their eggs ovulate and are otherwise healthy, but they produce no offspring. Since humans also have the L2 protein, this finding, published February 5 in Developmental Cell, gives researchers a new place to look for answers to currently unexplained causes of female infertility. L2 plays an important role in cells by activating mRNA decay, a system cells use to turn off gene expression when the proteins encoded by the mRNAs are no longer needed. Some of the team’s collaborators had previously found that L2 is needed for normal blood cell development. These earlier studies also suggested a link to female fertility, but whether L2 played any role in the egg itself remained unclear. To answer this question, Cook-Andersen and her team worked with female mice engineered to completely lack the L2 protein only in their eggs. The protein continued to function normally in all other parts of the mouse body. To determine what effect this had on fertility, Cook-Andersen’s team set up an equal number of fertile male mice with 10 females lacking L2 in their eggs and 10 normal females. Then they tracked the groups for six months. In that time, the normal mice produced regularly, giving birth to a litter of seven or eight pups approximately every 21 days, for a total of about 60 baby mice. Meanwhile, the female mice lacking the L2 protein in their eggs didn’t have a single pup. The team next asked why the L2-lacking mice were infertile. They found that L2-deficient eggs were unable to undergo global transcriptional silencing, a process that normally happens in the final stages of egg growth. During this time, transcription — the conversion of gene “recipes” encoded in DNA to mRNA, the messenger that carries the recipe to the cell’s protein-making machinery — is completely shut off. It’s an important step in making a good egg in animals, from worms to humans. Eggs remain in this “quiet” state until they are fertilized and begin developing as an embryo. 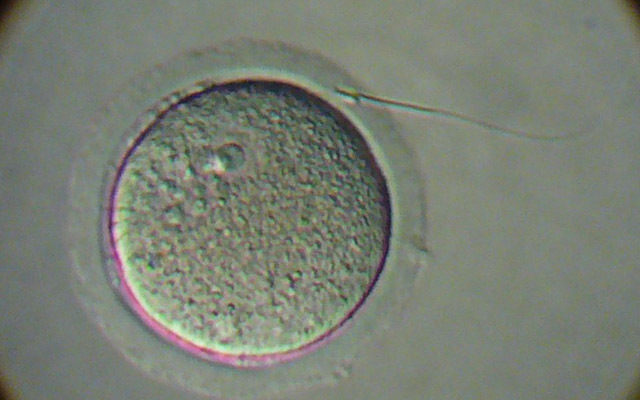 Eggs lacking L2, however, failed to undergo this step and continued transcribing genes into mRNA and producing proteins. Cook-Andersen said it’s clear that the mice’s infertility was due at least in part to their failure to undergo global transcriptional silencing. But it’s also possible L2 affects other factors influencing fertility as well. Beyond their potential significance in our understanding of human infertility, Cook-Andersen said these results are scientifically exciting because they indicate that L2 and mRNA decay play important roles in global transcriptional silencing. Looking more closely, they found that L2 degrades mRNAs that regulate marks on proteins intimately associated with DNA in the egg, which provides a clue as to how L2 and RNA decay might shut off transcription in the egg. Previously, not much was known about how this crucial developmental event might occur at the right time in egg development. “Many research groups are looking at how genes are regulated from the perspective of which genes need to be turned ‘on’ for a cell to advance to the next stage of development, but now we see that it’s just as important to know which genes need to be turned ‘off,’” Cook-Andersen said. In the future, the team plans to determine if L2 plays a role in human infertility. In the meantime, they are using the mouse model to learn more about the steps needed for global transcriptional silencing and to identify additional factors required to make a good egg. Study co-authors also include: Jennifer N. Dumdie, Kyucheol Cho, Madhuvanthi Ramaiah, David Skarbrevik, Sergio Mora-Castilla, Jens Lykke-Andersen, Louise C. Laurent, Miles F. Wilkinson, UC San Diego; Deborah F. Stumpo, National Institute of Environmental Health Sciences; and Perry F. Blackshear, National Institute of Environmental Health Sciences and Duke University Medical Center. This research was funded, in part, by the National Institutes of Health, Burroughs Wellcome Fund Career Award for Medical Scientists (1015559), Women’s Reproductive Health Research (K12 HD001259), Jones Foundation for Reproductive Medicine and American Society for Reproductive Medicine.